We develop robust, high-performance solutions for financial markets to increase competitiveness, scalability, and functionality. Based in Singapore, Hydra X develops professional trading technology solutions that connect digital and emerging asset classes with the financial markets. Our solutions help you to increase competitiveness, scalability, and functionality in order to take advantage of the potential of cross-asset trading. Sigma by Hydra X, the next generation trading platform, will be launched soon. Connect seamlessly to your own accounts on the major digital asset venues. Connectivity to institution-only liquidity pools, CFDs, FX and futures venues is coming soon. Customise workspaces to your trading workflow by adding, removing, dragging and dropping various modules. 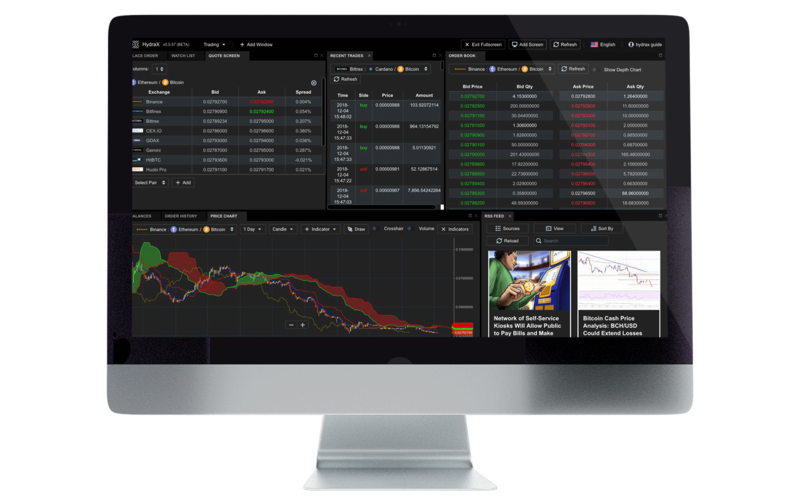 Trade, transact, and transfer digital assets across various venues; instantaneous price trades; leverage intelligent algorithms for trading, order management, arbitrage, market-making and liquidity provision. Aggregate management of portfolios on multiple venues within a integrated portfolio performance dashboard. Customise a personalised, real-time news feed via RSS feeds and social media. Secure and encrypt your user credentials locally; sensitive information never touches a central server or the cloud. Social trading, automated/algorithmic trading, real-time alerts, arbitrage matrices, customisable scanners, web access and dedicated mobile apps are all coming soon. Discover our full suite of features for yourself by signing up now!